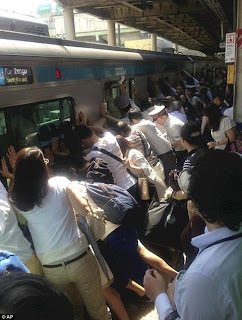 I loved this, now let's do it with our environment: "a train north of Tokyo was pushed to the side by a crowd of people after a woman fell under it. What the sources don´t mention is that for such things to happen, people have to notice the situation and react to it. When people react to the situation they make others aware of it, and inspire them to do the same."